Let′ s look closer at each one. This first tip is the SEO cornerstone. You must offer value to your visitors. And what′ s this value made of? That′ s a high–quality product and gripping content that people will naturally like. And it′ s a must I′ d say — with poor product and weak content, chances of success are really small. And a good and irresistible offer on your site will help you optimize it, get links and traffic, as it′ ll just work like a magnet to people — even when you don′ t stir a finger. Some hints: if you′ re selling some product or service, for example houseware, your site may contain not just a catalogue of goods and a couple of lines to persuade people to buy. To offer more value to your visitors, you might add some articles or reviews about how to choose furniture, or how to take care of nylon curtains, and other useful stuff. DO IT NOW! Take a minute to think of your website′ s content. Try looking at it with the eyes of your visitors. Is it really valuable for them? Think what (or what else) you can do to make your webpages useful. When we′ re writing articles and distributing guest posts, our #1 aim is to get publicity and sales. But alongside with that, guest posts can also make a huge difference for your site′ s rankings! How come? Besides sharing some news, the posts hosted on popular blogs can provide high–quality one–way links to your site. Just make sure you include a link somewhere in the author′ s bio, or as a homepage of your product, and you′ re guaranteed to have high–quality links! Here the context for links will be outstanding. If you write guest posts on topics specific for your niche, links stand in the natural environment — and Search Engines place much value on this. So that′ s a great way to get your site higher in the Search Engines! DO IT NOW! It′ s rather not a do–it–now task, but a "do–it–regularly" one. Write guest posts and host them on relevant resources, like niche blogs. Have you ever heard that Google and friends think much of blogs and forums? If not, then I′ m the one to tell you they definitely do. What′ s the conclusion? Either for traffic or rankings, you must try to get links from forums and blogs. It should be mentioned, however, that for the most part links in blog and forum comments are nofollow and don′ t have much SEO value (which is reasonable, as the nofollow attribute was originally used to fight comment spam). Still, it doesn′ t mean that you should not take advantage of links you place there, because if your comment is worthy and informative, people may jump to your website if they find it interesting. And sure enough, if the forum thread is popular and daily visited by many people, this may lead to some traffic boost. That′ s why it′ s better to leave fewer and better comments at fewer and better blogs/forums. If the resource is spammy, inactive or has lower quality content, commenting on it is a complete waste of time. To get a link from a forum, find one with a topic close to your site and join discussions there. How do you get a link? Easy: most often, in forums you can put a text link to your site into your signature. Here′ s a warning by the way: do not leave spammy comments. If you′ re a frequent guest at any forum, you must know how weird it may look. "Get used cell phones cheaply" with a link. Why in the world should I care for used phones??? So be careful not to annoy people with your advertising and links. You may not only earn the reputation of an idiot and spammer. Forum or blog admin may kick you out for violating the rules. Comment on posts that really grab your attention or when you have something to add to the discussion. If you think you can′ t answer others′ questions, just ask your own ones. Try to make publicity your priority, and not just SEO links. DO IT NOW! Another do–this–from–time–to–time direction: comment on forums and blogs and put a link to your site in your signature (or name). Here′ s a relatively new word in website promotion: getting the attention of bloggers and getting them to link to you. What if a good blogger writes a review about your product and puts in some links? This would definitely add up to your sales. Or here′ s another option: you can write an informative and useful guest post for somebody′ s blog with a link to your website, naturally embedded into the author′ s bio. Besides gaining good online reputation, this may help you get some high–quality links from relevant resources. DO IT NOW! Try to get reviewers with good traffic write on your site′ s topic, and put links to your web pages. Now it′ s high time you start thinking link bait not link building. That′ s about creating something that inspires other people to link to it. What do you need that will work as a link bait? The answer is easy: you need stunning content that people naturally want to link to — not because you ask them to. They can pass it to each other, link to it, tag it, and in other ways tell others about the bait. It′ s much about being creative. Doing something people will want to tell each other — and putting your link in it. Quite often, your idea will get a life of its own — and start to spread like a virus. Everyone wants to see it, and when they do, they all want to share it. When I was at junior school, a boy studied with me who was telling unbelievable stories. Whatever one was talking about, Steve always had a story about "how I did something and what happened". Once he said he drove a police car — and we were only 7! After that everyone wanted to be friends with the boy–who–drove–a–police–car. And though now we all realize this was fiction, back at that time, Steve was the coolest guy to hang out with — due to his stories that worked like "link bait". Want some link baiting hints? Though it′ s totally up to you to think of something unusual and grab everyone′ s attention, I can give you some good tips. So what can you do to make a link bait? Let′ s see. SEO is not all about linking. I like how you explained about link bait. Without stunning content your audience will leave your website in a heartbeat and that would negatively affect your bounce rate, which is something to consider for ranking. Great information on SEO, I have the SEO Power suite and have worked to get my site up in the rankings. I still have work todo. Tip 4 let me add more new ideas. Some great advice on SEO here. What about building backlinks to sites with no PR yet? Seems this module isn't very much help at all in this circumstance. I agree with poster above that suggested article and blog article functionality. 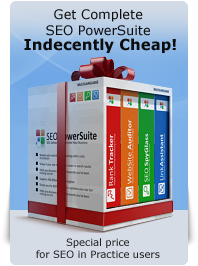 Would make SEO Powersuite the king of SEO tools. I totally agree, I think it's an absolute must to have very valuable content to survive as a business online. I really appreciate all the advice given on link building. Very helpful! Thanks so much! you are my best teacher.i follow you whole book for my SEO campaign..its give really help to me. i am agree with you content is important..but SEO point of view i saw some real cases that some website optimized without content..for example you type on google "click" and u see there have some sites optimized without word click you see there have no any word click...its mean its have strong backlinks..and i also optimized 1 site without content..www.121hm.com/offers/granisol/index.asp "keyword" granisol offer, granisol coupon, granisol discount..if you search on google with this keywords..you simply click on cashed.google give you "These terms only appear in links pointing to this page": granisol offer : so i want simply say you "off page" is important.